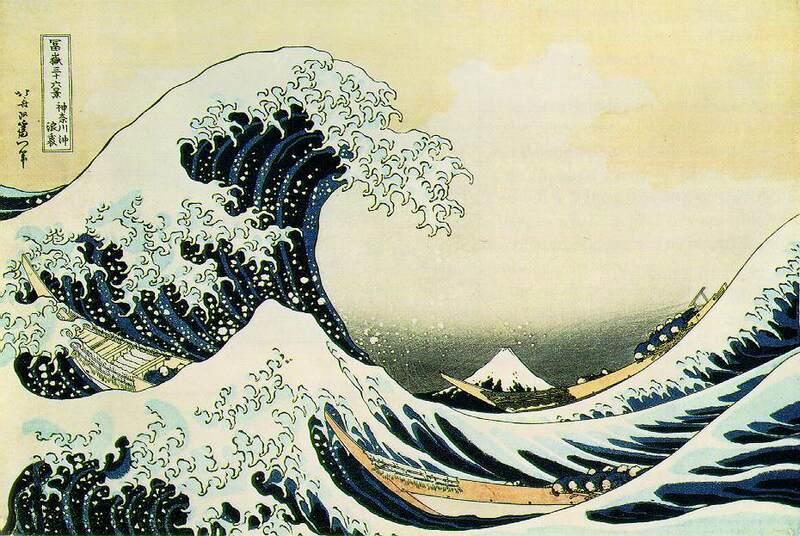 While the wind was blowing the other day, The Great Wave Off Kanagawa from Katsushika Hokusai’s Thirty-six Views of Mount Fuji came to mind. I felt like I was caught in the middle of one of those humongous waves riding out the storm. So, I figured while the weather outside wasn’t offering up any fun-in-the-sun, the wee tot and I could create something pretty cool. Japanese woodprint artists would traditionally sign their names using carved stamps along the side of their finished works. Hokusai was known as a master of creating detailed but yet soft prints of everyday life, otherwise known as Ukiyo-e. During the early 1800’s he meticulously created thirty-six wood blocks of Mount Fuji, which were enthusiastically appreciated by the western world and collected by famous artists, such as Claude Monet and Edward Degas. And, people of all ages still find his artworks stunning today. Well, my wee tot is a bit young to get out the wood carving tools – heck, I’ve done a number on myself using carving tools, so I figured we could stick with something a bit safer. 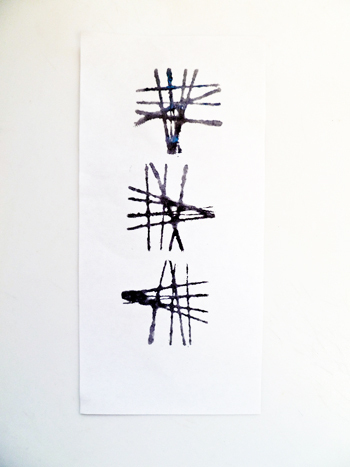 Wood blocks and string to create fun stamps for signing a paper in the style of Hokusai! Start by inviting your toddler to help find a nice wooden block to use for the project. Any size will work, in fact, we found a triangle that was perfect for this project! Now cut a length of string at least 3-feet long and attach a piece of tape to one end. Invite your child to press the string to the block and then wrap up the wooden block! You can offer a helping hand, if it’s needed (and allowed), and then secure the end of the string to the block with another piece of tape. Get out a sheet of paper along with a paper plate. Ask your child what color of paint he would like to use for creating his own unique stamps – just like Hokusai used to sign his artwork! 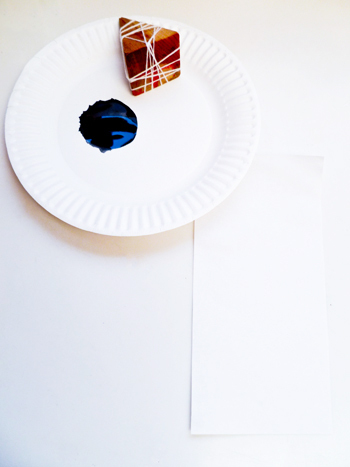 Help your child squeeze a couple squirts of paint on the plate and then encourage him to tap the string-wrapped block in the paint, and then in a linear formation on his paper. Traditionally Japanese writing is created in a top-down formation, which is how Hokusai signed his artworks. See if your child can do the same! If you’ve got an older child, he can create a watercolor painting in the style of Hokusai before using the stamps along the side of his finished artwork. Just make sure the painting is dry so his stamps don’t blend away into the painting. Don’t forget to find a special spot in your home to display your child’s finished artwork for everyone to see!